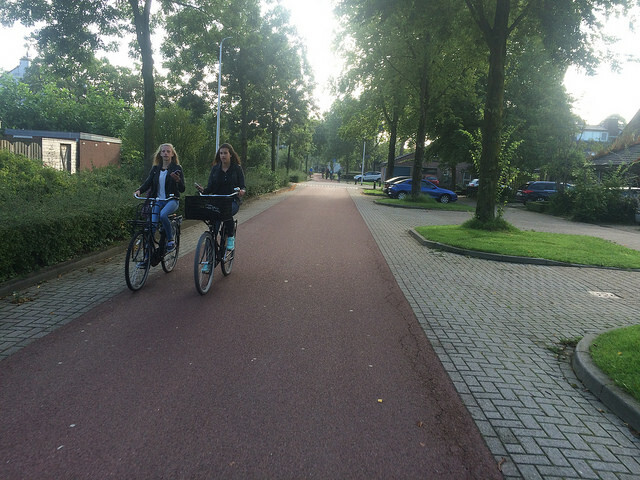 Space for walking and cycling generally needs to be segregated from each and from motoring. Giving space to walking and cycling often relates to a mix of “politics of space” or unwillingness or inability to change road layouts — in other words often it is not an issue of a lack of physical space but an unwillingness to reallocate space to cycling. Cycling and walking must be segregated from each other on links and at junctions as standard. Mixing modes should be exceptional, not the norm. There are some Irish and many international examples which show that this is possible. Mixing cycling and walking reduces the quality of both cycling and walking environments, and the largest impact is on pedestrians and people who cycle who have disabilities. 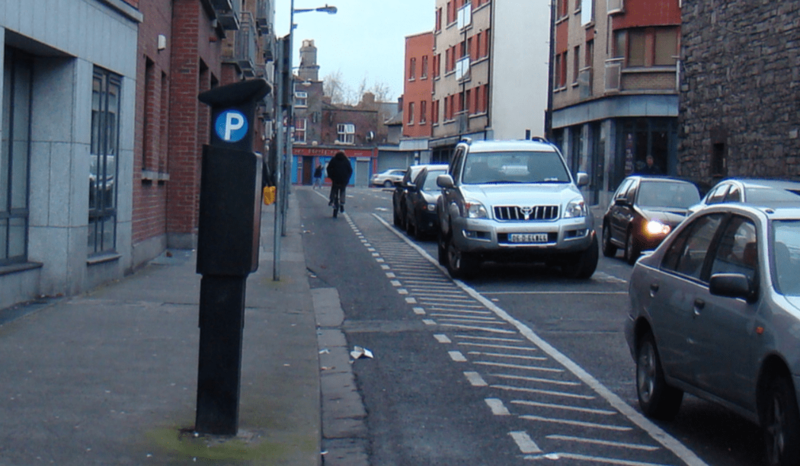 IMAGE: Parking on cycle lanes is not just an Irish problem. On main roads and streets, paint is usually not enough between cycling and pedestrians or between cycling and motorists. For main roads, painted cycle lanes should be an exception, not a default design. IMAGE: A low-volume, low-speed residential street designed to be suitable for sharing. On main routes, cycling needs to be segregated from motor traffic; cycling and motoring should generally only be only mixed using cycle lane or mixed lanes (traffic and bicycles share lanes) on low speed and roads and streets, with an annual average flow of less than 2,000 vehicles per day. IMAGE: Separate space at junctions. Along with separate space at junctions, standard crossings should not mix pedestrians and bicycle users at waiting areas or in the crossing space. 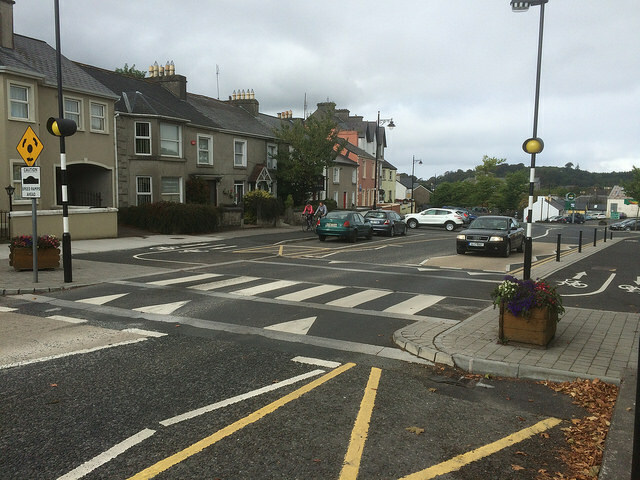 The use of shared toucan crossings must not be used as standard and designers must not direct cyclists into zebra crossings. Parallel pedestrian/cyclist crossings, where cycling and walking are kept separate, should be used as standard along and across routes. 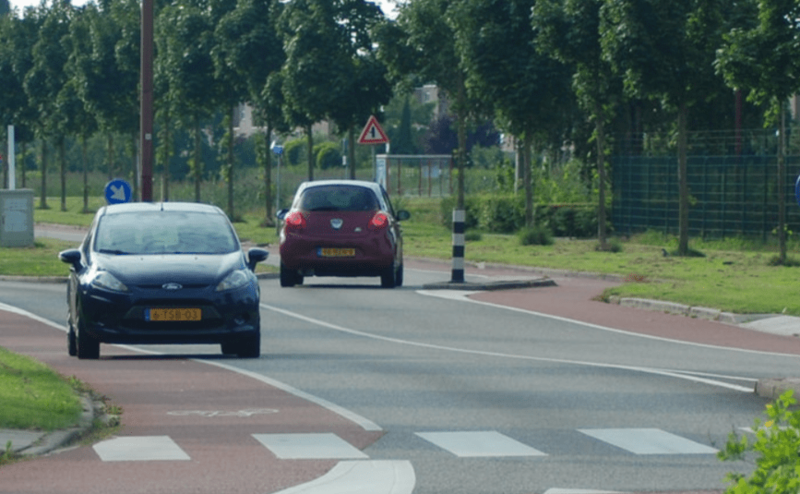 As well as use at crossings or junctions with traffic light signals, parallel cycling crossings should design beside Zebra crossings for use along links and at junctions, such as roundabouts, following the design used widely in the Netherlands and adopted in recent years in the UK. Where parking is provided alongside a cycle path or cycle lane, there must be a buffer which is wide enough to allow a car door to be opened without posing a risk of collision to a bicycle user. IMAGE: A bus stop bypass. 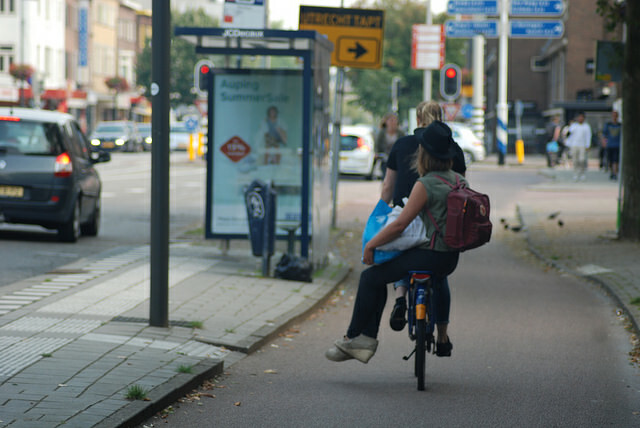 Bus stop bypasses, aka floating bus stops, should be the first choice at bus stops to avoid bicycle-bus conflicts. Only if space is not available should alternative layouts be considered, but consideration must first be made to making space for bus stop bypasses — ie reallocating public space from other uses, relocating the bus stop location or even CPOing land to widen a section of the street/road. 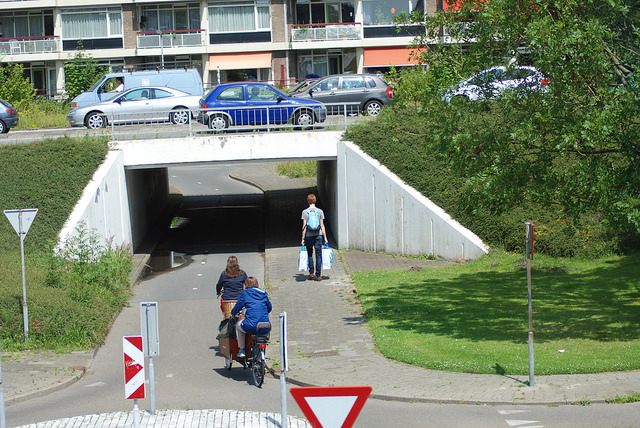 Grade-segregated crossings — underpasses and overpasses — should be considered at large junctions and for crossings of large or high-speed roads in both urban and rural areas. Well-designed grade-segregation is safer and often more preferable for all road users than mixing cycling and walking with high-speed or high-volume motor traffic. The prevailing designs of cycle paths and tracks in Ireland do not value horizontal buffers, which are a key to making cycle routes safe and to offer a higher level of perception of safety and comfort — which is in turn key to attracting more people to cycling. The buffer space can be greened but if shrubs etc are used they must be of low height and must be maintained.